Let's dive deep into editing techniques, specifically the fade to/from black (also known as dip to black). I'm an unabashed user of dipping to black as a means to transition between two shots. I'll fully admit my use of it is frequently just me throwing up my hands and saying "I don't know how to transition between these two shots." I tend to think excessive use of dips to black can be a sign of a less experience editor, but they're effective in moderation. Where do dips to black fit in film language? In his book In the Blink of an Eye, famed film editor Walter Murch makes a lot of references to how even audiences during the birth of cinema understood editing because a montage of images is very similar to how humans look at things in our day to day lives. Even when we're not blinking, we tend to look at things one at a time; our eyes dart quickly from one point of focus to another; everything between is filtered out. Try it right now. Read this text, then look at anything else. Do you remember focusing on anything that exists in the space in between this text, and what you looked at? Of course, because of peripheral vision you still saw everything between this text and whatever it is you looked at, but it's less likely you paid attention to everything in between. You might've even blinked before you looked at the second object. It's quite rare that we slowly "pan" from one thing to another. Our eyes functionally "cut" from one image to another thousands of times a day. You can think of editing as taking control of a person's eyes. A dip to black is like a palate cleanser which gives the editor permission to show an entirely new shot which might be completely unrelated; it's a clear demarcation of the end of an idea and the beginning of a new one. In real life, slowly closing and opening our eyes is like a dip to black. The sun setting in the evening and rising in the morning is also like a dip to black. Before it became part of film language, the visual of fading to black was already part of the human experience. This is both good and bad for editors, because dips to black can feel like you're forcing the eyes of the audience to open and close; this can be very distracting when done in excess. When the trailer for Spider-Man 2 trailer came out, my mom even emailed me saying she didn't like the section with all the fading in and out to black (it starts at 0:36). The shot choice in that section is pretty straightforward see/say editing where the shots match what is being said, but the editor clearly wanted the shots to mirror how the music beats come in and out. Your mileage may vary, but my eyes get faxtigued from the pattern pretty quickly, and I almost feel a little sick. 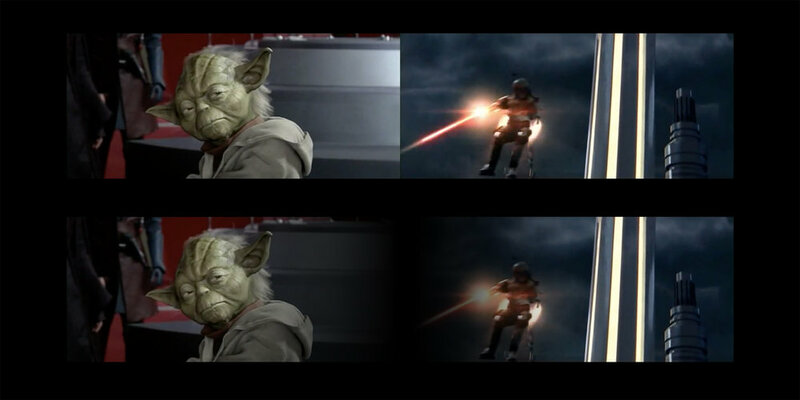 To further emphasize the distinction between dips to black and straight cuts, look no further than the "Breathing" teaser for Star Wars: Attack of the Clones. This trailer uses Darth Vader's breath plus Darth Maul's music as a way to set the pattern for the trailer. The structure is simple: fade into a shot, cut to another shot, fade out, and repeat. Notice how easy it is to transition between shots connected by dips to black; we don't question or even ask for there to be a connection. The fade out says: "This idea is done", and the fade in says: "Here's something new." It's almost impossible for shots connected by a fade to black to be confusing or dissonant. But look at the straight cuts. When there's a straight cut, we expect for a connection to be made; we'll make every effort to see how they connect. In some places it makes perfect sense like the cut between shots of Padme and Anakin. While these shots are from different scenes, the framing makes it look like they're facing each other. The shot of the space ship and C-3PO is pretty easy to connect too because they're both in similar looking environments. But look at cut of Yoda and Jango Fett. There doesn't seem to be any story or scene connection at all. The best I can figure is these two are paired together because they're recognizable characters which will get fans excited. If there was a fade to black between these two shots, you wouldn't even consider trying to find a connection. Same goes for the shot of Watto and Jango Fett's ship. I can't find any rationale for these two shots to be cut together, but again, if separated by a fade to black, I wouldn't spend any time trying to connect them. Even when not in motion, some black between the frames divides the ideas up. This might seem pretty straightforward to say, but it's interesting how the dip to black is such a strong division, I don't even make the slightest effort to try to connect the adjacent shots; it's not even a consideration. This is why excessive use can seem amateurish. Making one of the myriad possible connections with a straight cut takes more consideration, and is therefore more difficult. A less experienced editor might rely heavily on dips to black so they're not forced to make those connections. If you're making your own trailer, consider how a dip to black can help transition between different ideas, but also consider how you might be unintentionally dividing ideas or making the audience work too hard to watch the trailer. When taking control over another person's eyes, you should be as considerate of their experience as possible!